We know you are excited and thrilled with your purchase. We are here to help in case you need warranty service. All warranties sold are provided and honored by Swiss Dials Inc. only. 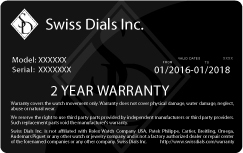 You will receive a Swiss Dials warranty card with your purchase as pictured below. Your watch purchase comes with a 2 year warranty. Warranty covers the watch internal movement only. Watch purchases on 2016 or after have a 2 year warranty. Watch purchases made before 2016 have a 1 year warranty. Warranty covers the watch internal movement only. Repaired or Altered Watches by an unauthorized third party, this will also void the warranty. Please contact us if your need to submit a warranty repair. Do not ship watches to our store without prior approval by our watch repair staff. Once approved ship the merchandise back to our store insured for the full purchase price with signature required, at your expense. We recommend providing a tracking number. If you are a customer located outside the U.S. and require warranty service or repairs please contact us for proper shipping instructions. There is a protocol that must be followed for shipping watch repairs into the U.S.A. Your jewelry purchase comes with a 60 day warranty for design or manufacturing defects only. Please contact us and return all defective or damaged products to us for examination and evaluation. Jewelry purchases on 2016 or after have a 60 day warranty against design or manufacturing defects. Jewelry purchases made before 2016 have a 30 day warranty against design or manufacturing defects. Warranty covers the jewelery . Special Request customization such as, but not limited to: engraving, laser, gem encrusting, plating, pvd/dlc coating, etc. Repaired or Altered Jewelry by an unathorized third party, this will also void the warranty. Repaired or Altered Jewelry by an unauthorized third party, this will also void the warranty. Please contact us if your need to submit a warranty repair. Do not ship jewelry to our store without prior approval by our repair staff. Once approved ship the merchandise back to our store insured for the full purchase price with signature required, at your expense. We recommend providing a tracking number. If you are a customer located outside the U.S. and require warranty service or repairs please contact us for proper shipping instructions. There is a protocol that must be followed for shipping repairs into the U.S.A.
Warranty replacements are subject to product availability. Our staff will contact you to determine your repair needs and help you through the repair process. If you require maintenance Here are a couple of preventive care tips for your jewelry and watches. Exercise care when wearing your jewelry because not all jewelry pirces can be repaired. Please refer to our to the watch or jewelry policy for items excluded from warranty repairs. Remove jewelry when using bleaches or corrosive products. Avoid exposure to household and industrial chemicals. Avoid exposure to chlorine which is commonly used in swimming pools and hot tubs. Avoid exposure to extreme temperatures, especially heat. Prevent scratches by keeping jewelry from rubbing other pieces of jewelry. This list is not all inclusive, please contact us if you have any questions. We recommend that you insure your jewelry in the event that it is lost, stolen or damaged. A separate insurance rider may be required to fully cover all of your fine jewelry pieces. Please contact your insurance company for more information regarding your insurance policy limits and requirements. This type of insurance can be purchased through your homeowners or renters insurance and NOT through Swiss Dials, Inc.